Coast Guard legislation approved Wednesday also would authorize maintenance funding for the Seattle-based Polar Star icebreaker and addresses federal regulation of ship ballast water discharges. A $75 million fishing vessel, marooned in a Washington shipyard because it was built with too much foreign steel, would be allowed to work in U.S. waters under a waiver to federal maritime law approved Wednesday by the Senate. The language was included in the Senate’s Coast Guard reauthorization legislation, which passed on a 94-6 vote. If approved by the House, the waiver could end the tangled legal status of the 264-foot America’s Finest, a nearly completed factory trawler built at Dakota Creek Industries of Anacortes to catch and freeze bottom-dwelling fish found off Alaska that has been stuck at the shipyard for more than a year. 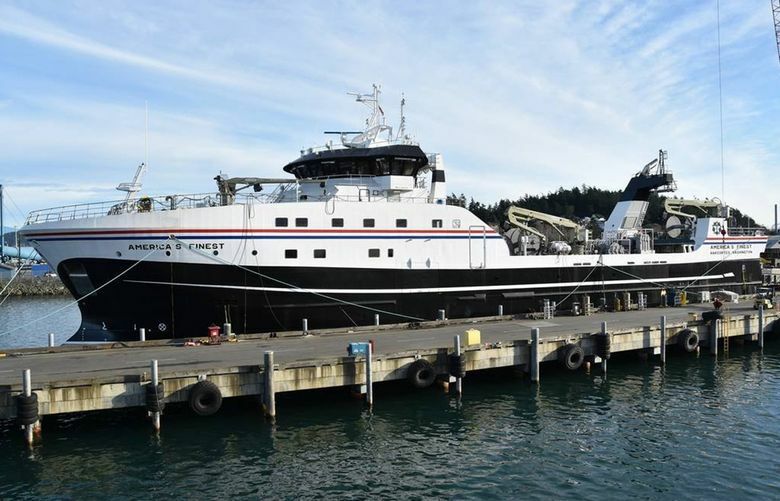 The vessel’s owner, Kirkland-based Fishermen’s Finest, contracted with Dakota Creek Industries to build the state-of-the-art America’s Finest to replace an aging vessel. But the construction effort went disastrously off course when the shipyard had parts of the hull cut and bent in Holland. That action ran afoul of the Jones Act, which requires vessels transporting cargo and people between U.S. ports to have a hull largely made of American materials. Dakota Industries shipyard officials have repeatedly said they didn’t realize that the Dutch work would violate the act. The Senate bill’s language, represents a kind of conditional waiver, calling for the U.S. Commerce secretary to revoke the waiver should an investigation determine that the violation was intentional. The Senate language also includes processing restrictions on Fishermen’s Finest, which were lobbied for by competitors, including shore-based seafood plants in Alaska but strongly opposed by the Kirkland company. These restrictions limit the amount of fish that can be delivered by other boats to Fishermen’s Finest’s vessels. They would extend for the six years, but they could be lifted earlier if the North Pacific Fishery Management Council comes up with a rule to regulate these deliveries. The Senate has struggled to pass the Coast Guard legislation, with an earlier version of the bill stalled in April on a procedural vote. Dennis Moran, president of Fishermen’s Finest, declined to comment on the Senate’s approval of the Jones Act waiver. Dakota Creek Industries, which took a financial hit and laid off workers because of the troubled status of America’s Finest, also declined — through a spokeswoman — to comment. The 389-page Coast Guard legislation also contained a plethora of other measures. They include authorization to fund an enhanced maintenance program for a Seattle-based Coast Guard icebreaker, the Polar Star, so that its service life can be extended until at least the end of 2025. The vessel, commissioned in 1976, is the nation’s only operating heavy duty icebreaker, but it has had numerous problems. During the last mission to Antarctica, the Polar Star suffered both engine failure and flooding, according to the Coast Guard. The legislation also includes a compromise deal that lays out a new regulatory approach to the discharge of ballast water, which can spread invasive aquatic species into new areas. This has been a contentious issue for years, with environmentalists concerned about the ecological damage from invasive species in the Great Lakes and other bodies of water. The legislation calls for the Environmental Protection Agency to keep its regulatory role over ballast water discharges and charges the Coast Guard with enforcement. The compromise drew praise from the maritime industry and a mixed reaction from environmental groups. Brett Hatl of the Center for Biological Diversity, an environmental group, said the bill would weaken protections against invasive species by giving the Coast Guard a “de facto veto” over moving ahead with new treatment technologies. But a statement from National Wildlife Federation and state affiliates in the Great Lakes region, said the bill maintained clean-water protections that the shipping industry sought to eliminate. Cantwell, in remarks Wednesday to the Senate, praised the legislation. She said it protects Washington, Oregon and California from invasive species by putting in law successful management practices previously established by those states. The bill also includes a permanent exemption for the incidental discharges of fishing vessels that do not pose a threat to the environment, according to Cantwell.